This book is perfect for those who are curious about minimalism and want to declutter their homes and try it out. I love that the author emphasizes that minimalism is a mind-set and a life-style, not an aesthetic or a decorating trend. It’s not about how your home looks; it’s about how you feel in your home. It’s not about having a set number of belongings; it’s about having the right number of items that belong in your life for a reason. I find the philosophy similar to the KonMari method of decluttering. Every item must have a purpose, whether it is useful or brings beauty into your life or just makes you happy. This book takes you room by room, and gives common-sense advice on decluttering each space, how to get rid of things you don’t need or want, how to store what is left, and how to keep more clutter from building up again. There is also a chapter all about how to get your family involved in decluttering the house and keeping it tidy. 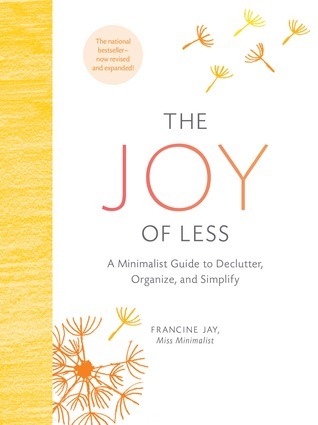 I would recommend this book to anyone who isn’t sure about minimalism, or who hates minimalism but just wants to declutter and find more space in their home. This book might change your mind about minimalism and what it really stands for!